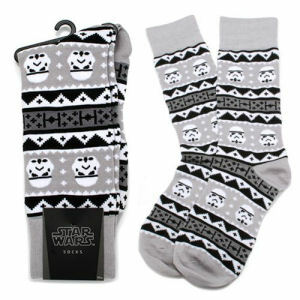 We have Just Sold out of Star Wars Stormtrooper Holiday Edition Tacky Sweater Socks. Not to Worry! Fill in the Notify me When Available and you will be the first in line for our restock of Star Wars Stormtrooper Holiday Edition Tacky Sweater Socks !! From the Star Wars collection by Cufflinks Inc.. Star Wars Stormtrooper Holiday Edition Tacky Sweater Socks. One size fits most (up to mens 12). Ages 13 and up. Officially licensed by Lucasfilm.